Your passport must have more than 6 months of validity in order to enter the Philippines. It would be convenient and efficient for you to lodge at AWH while you receive treatments there. Staying at AWH, you can read spiritual and inspiring books in the library, participate in spiritual seminars in the conference room, schedule ample time for various sessions (such as past-life reading/introduction to spirit guides/photon healing/personal consultation), meditate in the balcony decks, relax with massage therapy, and invigorate yourself with outdoor bathing at the spa. It will be a refreshing and inspiring experience. There are seven guest rooms in the Annex building in addition to a handy-capped access room in the separate building. Each room has its own bathroom with hot shower. The Eco Center is more economical yet clean facility despite the fact that it is closer to nature. Three domitory style bunk beds in each room accommodate maximum of 6 persons per room. Each room has its own hot shower and toilet to be shared with the guests in the same room. Bed linens and bathroom tissues are provided but you will need to bring your own amenities such as towels, soaps, shampoo, toothbrushes, etc. The following credit cards can be accepted with AWH. Credit cards can be processed through Paypal. Philippine Peso will be the currency for credit card transactions. The other currency will be converted to Philippine Pesos (a conservative rate will apply). Paypal processing fee of 4.4% and bank charges of 65 pesos will be charged additionally per transaction. The finest hotel in the area. It has a view of the Lake Taal and is equipped with a swimming pool. The rooms are nice and bright. The food in its restaurant holds high reputation. There is a casino in front of this hotel. 10 - 15 minutes to AWH by car. Located in the heart of downtown Tagaytay. Basic amenities, such as a conference room, a swimming pool, a tennis court, etc., are available. 20 - 25 minutes to AWH by car. Located near downtown Tagaytay. Each room has a balcony with a view of the Lake Taal. The facility includes a swimming pool. 20 minutes to AWH by car. Conveniently located adjacent to Robinson's shopping mall & supermarket Tagaytay, upper floors offer nice views of lake Taal. A decent Filipino restaurant "Josephine" is right in front of the hotel. 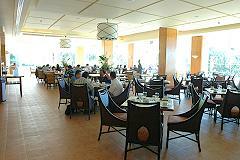 The rates are higher than Taal Vista hotel although Taal Vista has more graded facilities. 15 - 20 minutes to AWH by car. The closest lodging facility to AWH. 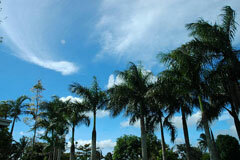 There is a clubhouse of Royal Tagaytay within walking distance. And the hotel guests can use its amenities such as the restaurant, the swimming pool, the tennis court, etc. 10 minutes to AWH by car. For your transportation convenience, charter van services can be arranged directly requesting to the managing driver. You may share a ride with other guests to enjoy lower per head cost. For your reference, there are many choices of recommendable restaurants in Tagaytay area.